This project was part of my PhD research (2012-2017), which is now completed. Please visit also the Github project page. CityGML datasets containing multiple levels of detail are scarce. Procedurally generated data in the CityGML format is non-existing. There are no free procedural modelling engines. Publicly available CityGML models usually contain lots of (topological) errors. 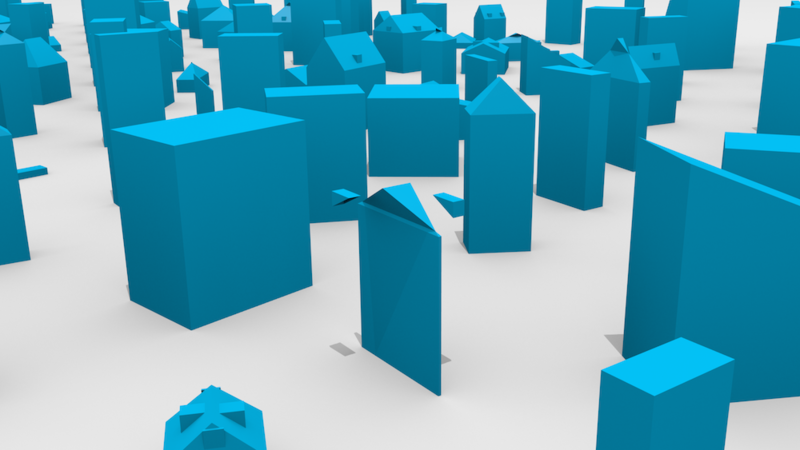 To solve these problems I have developed Random3Dcity, a basic and experimental open-source procedural modelling engine for automatically constructing synthetic buildings and their realisation in CityGML in multiple LODs. I am using the generated datasets for multiple purposes within my PhD project, such as benchmarking the performance of using a specific LOD in a use case, but possible applications are not limited to it. Hereby I bridge the gap and releasing the datasets publicly. The code of the engine has been released as well. 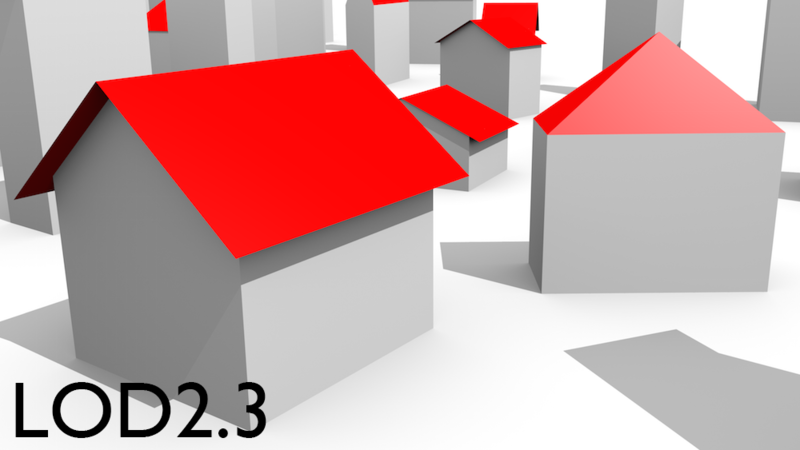 Along with this project, I have designed a new LOD specification for 3D city models that extends the one found in CityGML. The specification has been realised through this engine. 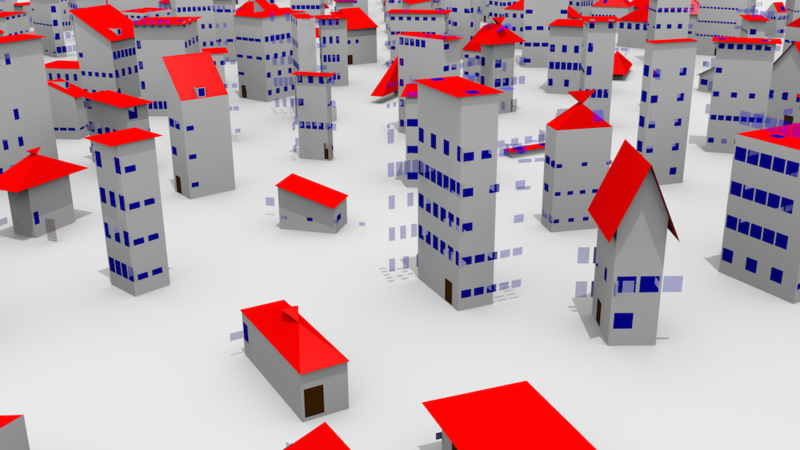 With its diverse buildings and the large number of their representations, Random3Dcity aims to be the most complete CityGML (and probably 3D) dataset available. However, be aware of its limitations, such as the experimental nature, and synthetic outcome. Random3Dcity consists of two parts. 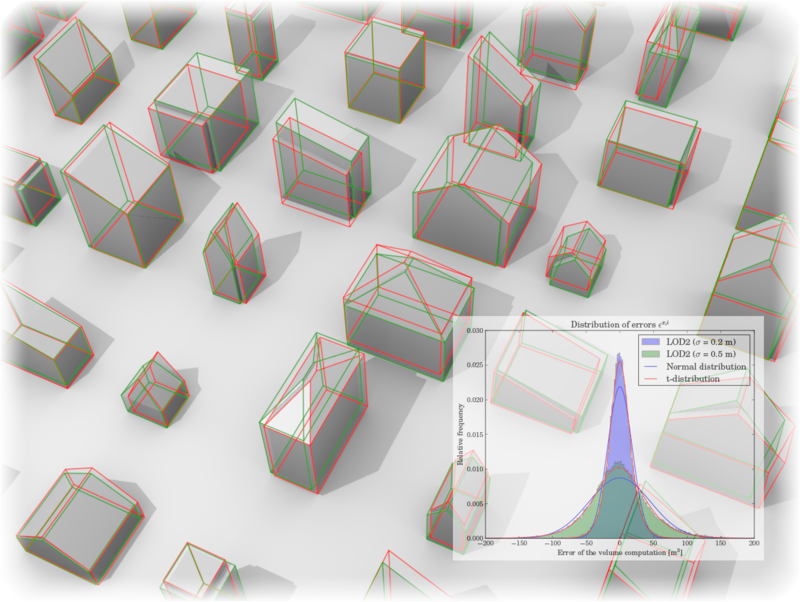 The first constructs buildings with random properties (procedural modeller), such as height, roof type and number of windows and their size. The algorithm to do that is relatively smart, it does it by adhering to a large number of constrains (e.g. that windows do not overlap), and takes care that the designed buildings look as realistic as possible. The engine stores these data in a human-readable parametric description (own XML schema), e.g. : <roofType>Gabled</roofType><h>2.89</h>. Because of this stochastic nature, the datasets are well suited for many analyses as an unbiased data source, and for recreating many different scenarios which might not be available in the real world data. With the current configuration, the number of different buildings is around 1054. The second part of the engine reads this data and realises them in 3D by generating CityGML files in multiple levels of detail. In: ISPRS Ann. Photogramm. Remote Sens. Spatial Inf. Sci., vol. IV-4/W1: 51-59, 2016. Random3Dcity - the CityGML procedural modelling engine and synthetic dataset from Filip B on Vimeo. 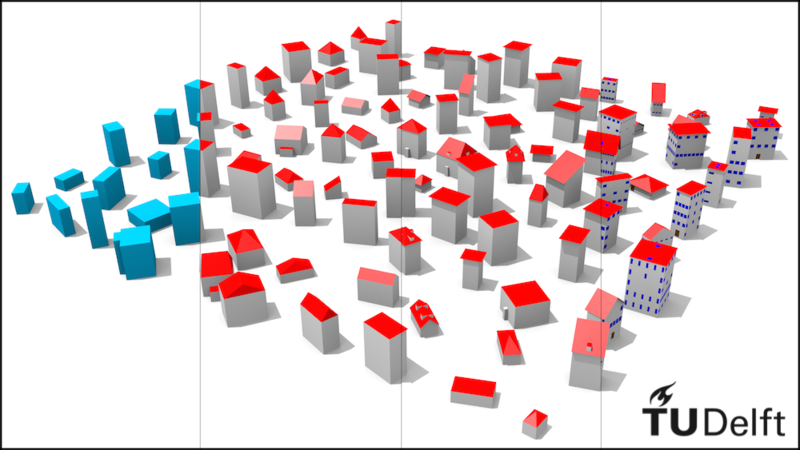 As one of the aims of my PhD research, I have developed a new specification that refines the CityGML LOD specification into 16 LODs, four less ambiguous and finely specified variants that fit within each of the current LODs 0, 1, 2 and 3, intended to supplement the CityGML specification. They are a product of a thorough research of 3D production workflows, contact with practitioners, and examination of presently available 3D models. 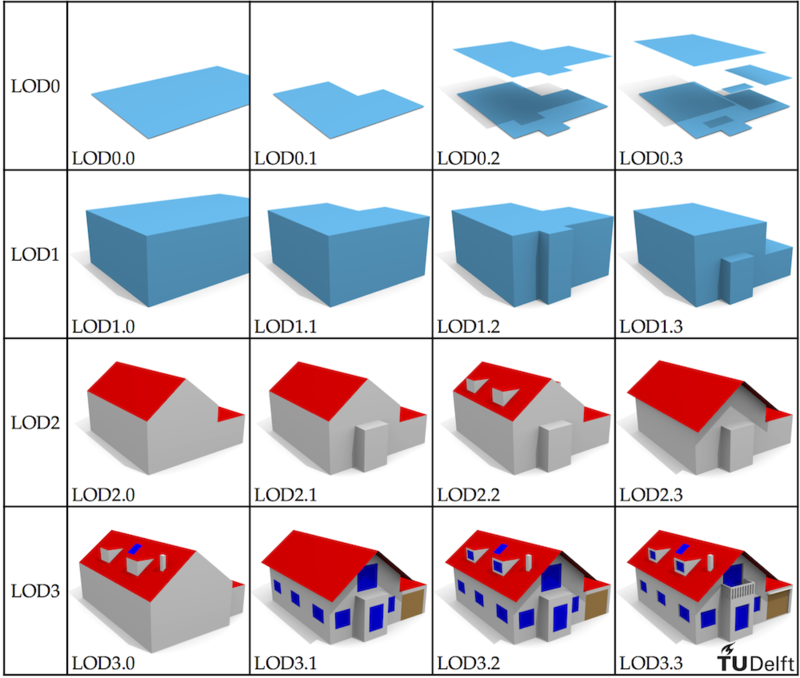 A visual description of the specification is shown on the right, and a composite of four LODs of a dataset with 100 buildings is shown below. Computers, Environment and Urban Systems, vol. 59: 25-37, 2016. 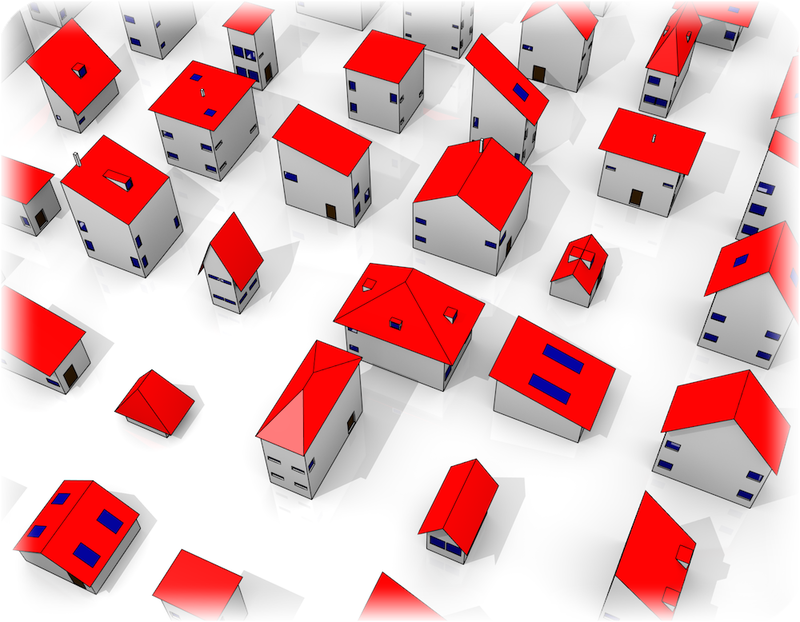 The specification above was developed independently of CityGML, and it is usable outside its scope. The four LODs on the image on the left are: LOD1.1, LOD2.0, LOD2.3, and LOD3.3. The first two representations have their walls modelled as projections from the roof edges. 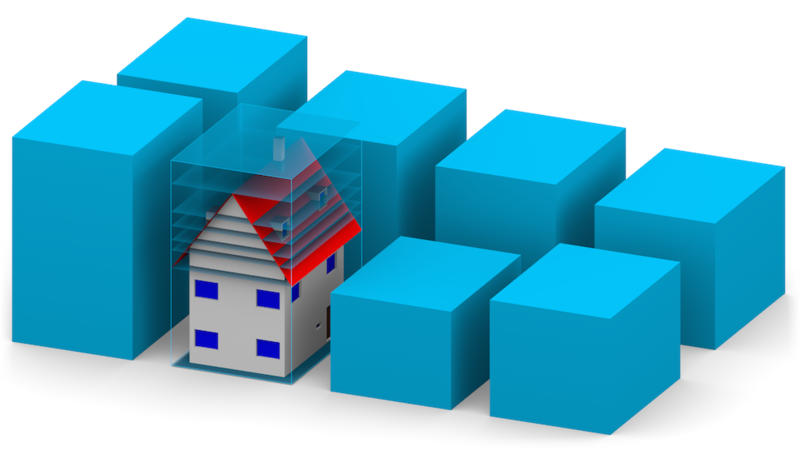 Random3Dcity is capable of generating the basic interior in three levels of detail: one solid for each storey, a solid for the whole building (offset from the shell), and a 2D polygon for each floor. These solids may, for instance, serve as ground truth models for building volume computations. The engine generates a few interior parametres such as joist and thickness of walls, and it computes the geometry of solids. Each of the buildings is generated in multiple levels of detail (16 of them). Further, they are also generated in multiple geometric references (e.g. the varying height of the top of the LOD1 block model). On the right side you can see seven variants of the LOD1 block model with respect the used geometric reference for the top surface. Further, varying references have been used for the footprint: the actual footprint and the projection from the roof edges. This was also implemented for the LOD2 model. ISPRS Journal of Photogrammetry and Remote Sensing, vol. 116: 42-54, 2016. If you are not willing to download the source of the code and generate the datasets yourself, here I have prepared a zipped collection of sample CityGML data. The zip contains also OBJ files that were generated with my tool CityGML2OBJs. The description for each representation is given below. You can convert this data to OBJ with my tool CityGML2OBJs. All <gml:LinearRing> and <gml:Polygon> have a <gml:id>, which was randomly generated (UUID). Datasets ending with _S0.gml do not contain semantically differentiated surfaces. The coordinate system is local. 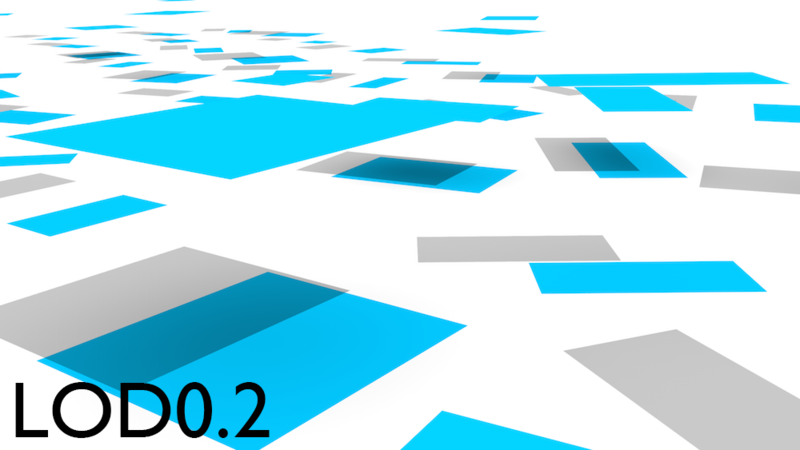 The data complies to CityGML 2.0. The full product of the engine contains more datasets with shuffled variants (392 to be more precise). For instance, not all LOD1 variants with the heights are put here. Please contact me if you require additional variants, or generate them with the provided code. An ancillary engine has been created to simulate acquisition errors to the original dataset above. This data is suited for error propagation analyses (for instance, see my related paper). Furthermore, because of potentially broken topology in some files, its use may be extended to other domains, such as testing validation and repair tools. The error is equivalent to the ISO 19157 spatial data quality element positional accuracy. Absence of spatial correlation of uncertanties is assumed. The uncertanties are equal for all coordinates. The vertical (z) coordinates are not treated separately. Overlapping objects are unwanted. Hence, these datasets may also be helpful for testing validation and repair software. The below datasets contain buildings that overlapping, in multiple LODs. These datasets contain shuffled semantic surfaces and/or missing semantic classes. 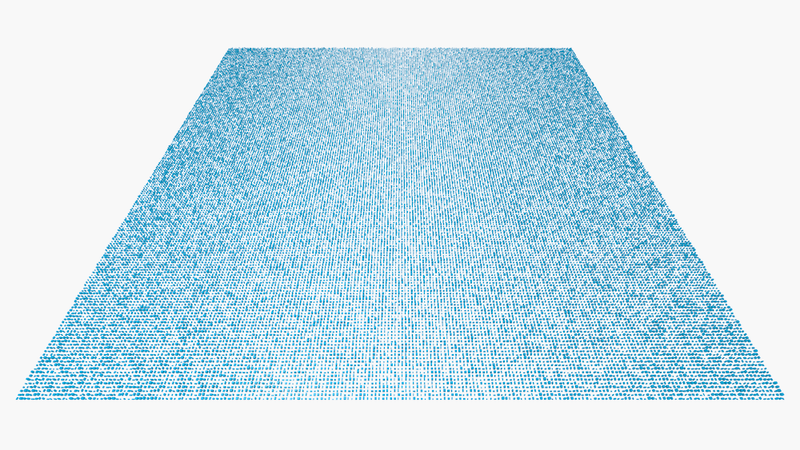 The semantics for surfaces were uniformly randomised (1/3 for each of the following: GroundSurface, RoofSurface, WallSurface). (substituted with the 3 classes). The following LOD3 datasets contain topological errors such as broken solids and polygons whose interior lies outside it. LOD3 LOD3-error-topology [21MB] Brep. Most of the errors are outlying windows. LOD3 LOD3_solid-error-topology [1.9MB] Solids. Most of the errors are self-overlapping roof tips. If you use the data and/or the software please contact me because I would like to list your project on this page as an example of use, and I would love to hear about how did you find it useful. Please let me know if you have used the data, so I can add you on the list. The datasets have been used in the CityGML Quality Interoperability Experiment. Doodman, S. et al. (2014): A Voronoi-based approach for geosensor networks coverage determination and optimisation in 3D environments. Proceedings of the Extended Abstracts of 3D Geoinfo 2014. Afghantoloee, A. et al. 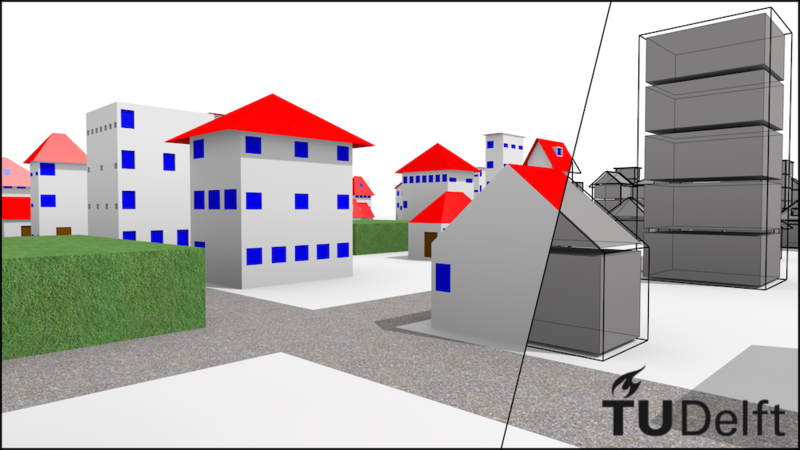 (2014): A perspective view-based approach to determine the geosensor coverage in 3D vector environments. Proceedings of the Extended Abstracts of 3D Geoinfo 2014. Due to the completion of the project, I cannot promise updates. If you have a question feel free to contact me. Furthermore, please let me know if you use the data so I can put it in the showcase section. Do you provide the code of the engine? Yes, the project is open source. The code is released on the Random3Dcity Github project page. Who developed the engine and the datasets? They have been developed in 2014 by Filip Biljecki, PhD candidate at the Delft University of Technology, the Netherlands. Why did you develop this software? 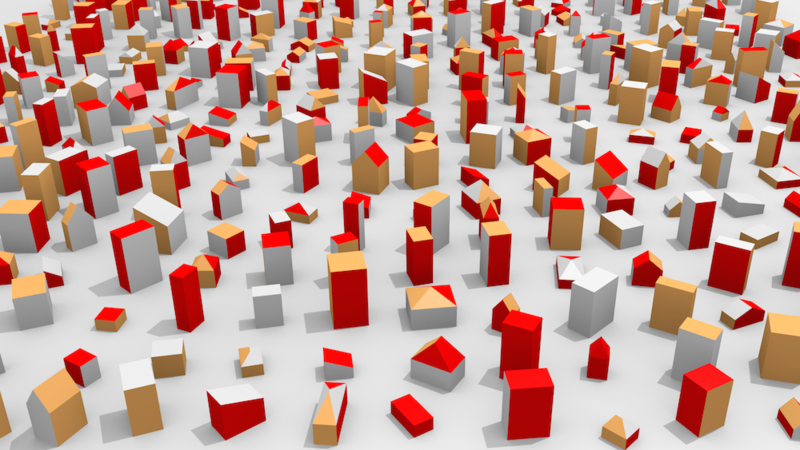 To tackle the absence of multi-LOD datasets in CityGML, to test my refined LOD specification, and to address the lack of procedural modelling engines supporting CityGML. The generated data has been used in multiple application domains (check the showcase above). Let me know if you have a new idea. This is cool, but I cannot do much with CityGML files. 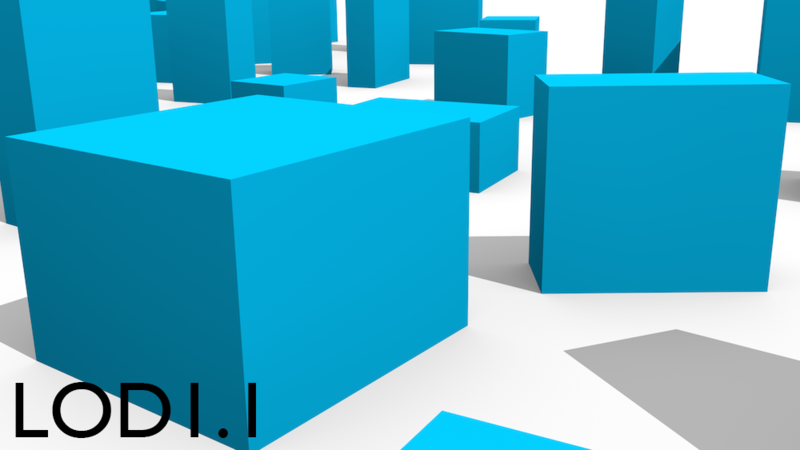 CityGML files can be converted to OBJ to increase their usability. You can do this with my tool CityGML2OBJs. May I request a particular enhancement of the engine and/or a modified dataset? Yes, I will gladly comply provided it won't take me too much time. Further, if your research overlaps with mine we can have a chat about a potential collaboration. What do I need to do after using the data and/or the code of the engine? Please cite the research paper that is published about Random3Dcity, and clearly state that the source of the data is the engine Random3Dcity developed at TU Delft. Are there data with more/less buildings? Yes. In this case, the number of 900 buildings was selected as the optimal balance between the diversity of the data and the size of the dataset. 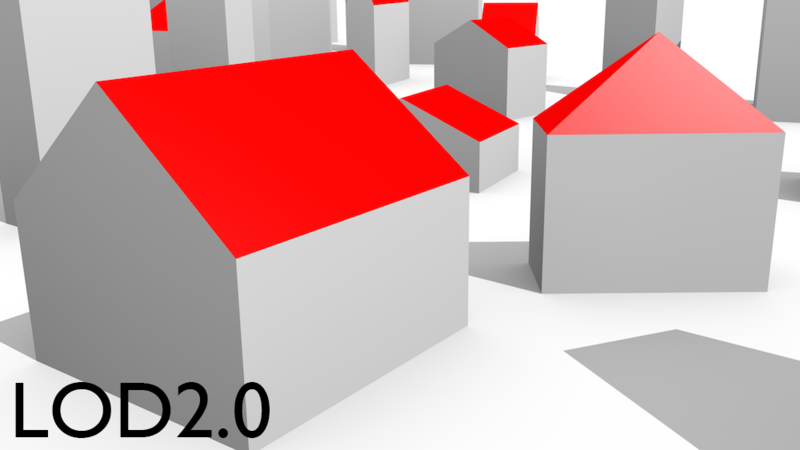 You can download the software and generate any number of buildings. Is it possible to have a dataset with equal buildings (like the one in the image of the header of this page)? Is it possible to have objects from other thematic classes, such as lakes and roads? Yes. I have coded the generation of a street network (Transportation module in CityGML), and vegetation. But please understand that buildings are the most prominent theme of 3D city modelling, and I have focused on this class. Implementing further thematic classes and resulting in more realistic settings would take an amount of time which is not justifiable with respect the resulting benefit (from the perspective of my PhD needs). Is it possible to randomise the position of the buildings, i.e. not have them gridded? In theory yes, but I did not do much work here and such datasets are not readily available. 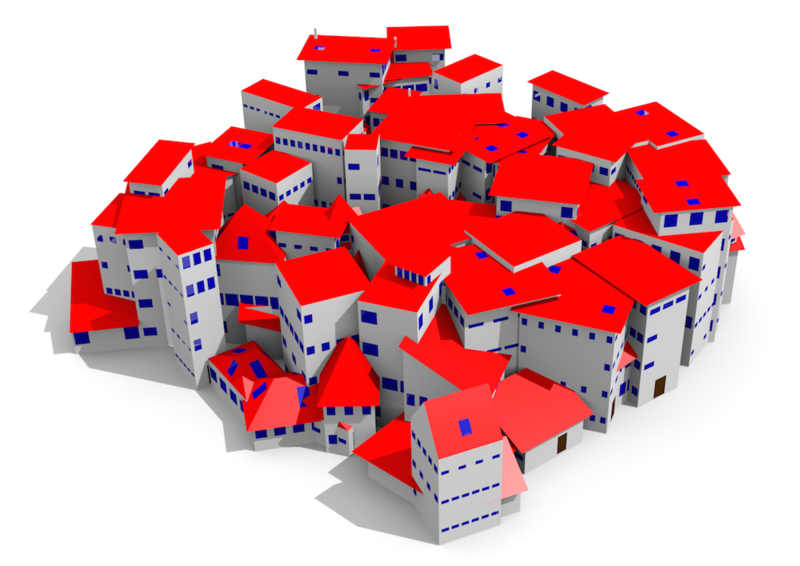 I have made a modified version of the engine, where I have randomised also the position of the building, however, this resulted in many of the buildings overlapping with each other. This can be solved, but I don't see much benefit in having data which is not gridded. On the other hand, this shortcoming unexpectedly became a feature, because it is used to test geometry repair software. What about LOD4 models with interior? Random3Dcity generates a basic interior in multiple LODs, based on a research paper from an MSc student at my department. However, "full" LOD4-grade models with rooms, doors and furniture are not and will not be available in the future for many reasons. Implementing interiors would be a major effort, without much benefit for my project. Second, CityGML requires a higher degree of detail for the interior (rooms, doors, furniture) which is beyond the scope of this work. Third, LOD4 models are still mostly academic and do not have many applications. Copyright © 2017. All Rights Reserved. Last update in May 2017.